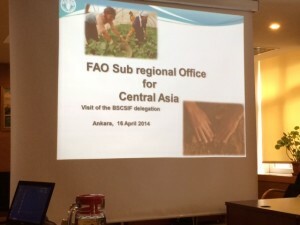 On 16 April 2014, representatives of BSCSIF had a meeting with the representatives of Subregional Office for Central Asia of the United Nations Food and Agriculture Organization (FAOSEC) based in Ankara, with the purpose of exploring and discussing potential areas of collaboration that could be built in the future. The meeting was attended by President of BSCSIF Mr Ismail Safi, Executive Director of BSCSIF Alev Balgi, and Project Coordinator from Istanbul office, Natalia Ciobanu. Given the shared interest in the sustainable development of the region, and the fact that some countries represented in BSCSIF are also members of FAOSEC, the meeting focused on possible contribution of BSCSIF to the development of FAO projects in Azerbaijan, Kazakhstan, Kyrgyzstan and Turkey. 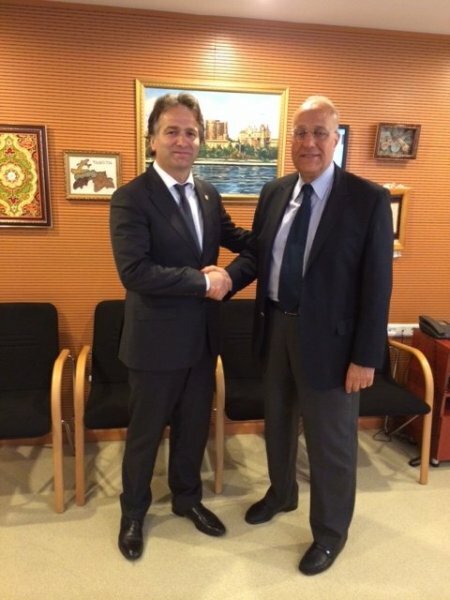 Following the opening remarks of FAO Representative for Turkey and Subregional Coordinator Mr. Mustapha Sinaceur, and BSCSIF President, Mr. Ismail Safi, the discussion was held around areas of work of the two organizations. BSCSIF Executive Director Alev Balgi shared BSCSIF experience in project design and implementation and its collaboration with various international organizations, including its consultative role within ECOSOC. The discussion then focused on specific areas where BSCSIF could contribute to FAO projects in the region based on its previous experience, the knowledge base of its specialists. From BSCSIF side, Ms. Natalia Ciobanu underlined that the Black Sea–Caspian Sea region has been facing major environmental problems with implications for economic and social welfare on national and international levels which can only be solved through regional cooperation. She shared the example of the “Side by Side for the Black Sea” project, implemented by BSCSIF in 2011 as a part of BSCSIF experience in capacity building activities in the region which was awarded by United Nations Environment Programme (UNEP) as a Best Practice Concept in the field of Environment and Health. She suggested that joint projects can be focused on social and economic matters, local small business, water resources, health, and support to rural women in the economy. FAO technical officers presented their fields of expertise and the ongoing and future projects where contribution is needed from the side of inter-governmental and civil society organizations. The meeting was concluded with FAOSEC inviting BSCSIF to contribute to the preparatory meetings of the regional conference week and as observers on areas on BSCSIF technical expertise. 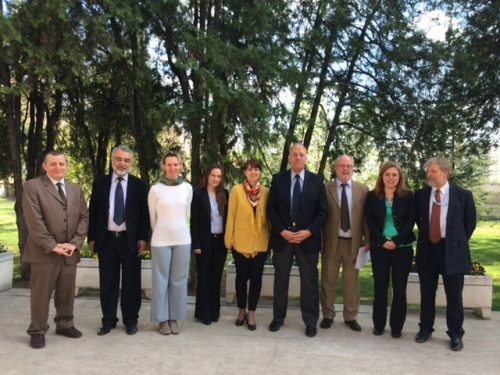 It was also agreed that the cooperation between FAOSEC and BSCSIF on specific projects would begin with one project that best fits BSCSIF expertize. In the upcoming weeks the two organizations agreed to work on developing a common project and attracting resources for its implementation. Since its establishment in 2009, BSCSIF has been working to consolidate the regional cooperation at many levels and ultimately to achieve sustainable development in the region.